The second of the Weekend Study Support sessions took place over the weekend of the 26-27 January for those studying on the Intermediate courses, as well as Company Law and EU Law. 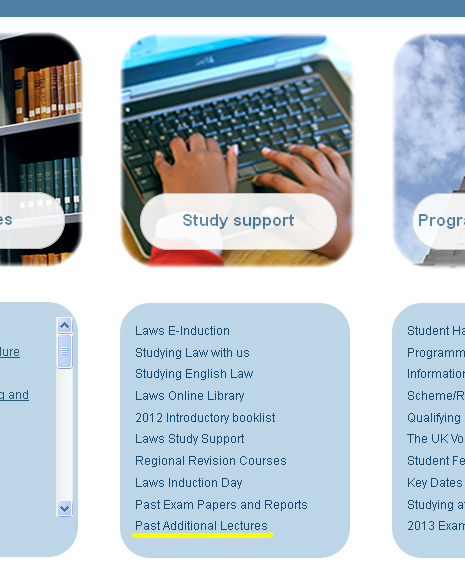 Audio recordings from previous Weekend Study Support sessions (November/December 2012) are now available on the VLE for Jurisprudence, EU Law, Criminal and more. There are also a number of handouts available here to accompany the Jurisprudence recordings. To book your place, click here to apply online. You are advised to book as soon as possible, particularly for the latter weekends, as the exam period draws closer. Please note that only students registered on the courses covered at the above weekends will be permitted to attend. Places are available on a first come first served basis, and should capacity be reached, online applications will close.